Easily automate the process of reviewing, re-teaching and remediating. An effective teaching strategy is utilizing students’ individual data to guide instruction. This Premium Membership feature automatically generates Review Lists composed of words that students need additional practice with. Lists are based upon students’ previous spelling and vocabulary test results. Identify error patterns which can help guide further instruction. 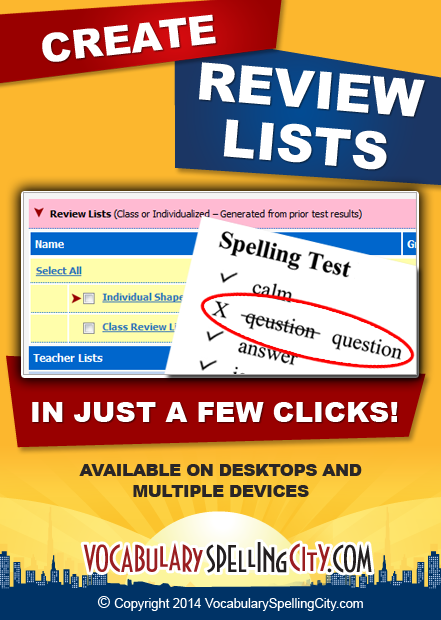 Create review lists from spelling test results, vocabulary test results, or both! Generate meaningful, cumulative review lists for individual students or an entire class. Individual review lists include words specific to each student’s test results for personalized instruction. Create assignments for additional review, practice, and mastery of those troublesome words.